Dogs can eat lots of the same things as us humans, but some foods are toxic. We all know that dogs can't eat chocolate, but there are some foods that you might not be aware of - like macadamia nuts. So to help avoid feeding your dog something that might make them sick, here's our toxic food guide. Please share with your doggy friends if you find it useful! Seems like a no brainier but in case you thought it might be funny to give your dog a beer, think again. It can cause your dog serious harm. Poisoning can occur if a dog consumes ethanol, found in alcoholic beverages, mouthwash and perfume (amongst other sources). It can cause vomiting, diarrhoea, decreased coordination, difficulty breathing and induce coma. The lethal dose is 5.5ml/kg, which makes smaller dogs more susceptible. You should never feed your dog any alcohol, so be sure you finish your wine! Apple seeds contain a compound called amygdalin, which is a form of cyanide which can be fatal for dogs. Feeding apples in moderation is fine, but never feed whole apples and be sure to cut the core and seeds out first. Avocados contain a compound called persin, which is toxic to dogs. Luckily, most of the persin is found in the plant's leaves and in the unripe fruit. So the risk isn’t high unless you’re growing avocados at home (and at $5 a pop, lucky you!). The bigger issue is the seed, which can be a choking hazard. It’s not easily digested and can cause an obstruction in the digestive system with serious consequences. In it’s uncooked form bread dough can cause problems like gastric distention, metabolic acidosis and central nervous system depression. Symptoms include weakness, coma, hypothermia, and seizures. The yeast in the dough causes it to rise, which is great for making fluffy bread but catastrophic if it happens in your dogs stomach. It can create internal blockages and the release of ethanol into the digestive tract, which can be lethal. Most people know that you can’t feed dogs chocolate. The reason you can’t feed chocolate is because it contains a compound called theobromine, which is toxic for dogs. Not all chocolate is the same though, as dark chocolate is 10 times as toxic as milk chocolate. This is because theobromine is in the cocoa, so the more cocoa in the chocolate the higher the level of this toxic compound. Chocolate containing a theobromine doses above 100mg/kg bodyweight can be toxic to dogs, which is about 25g of chocolate/kg. So while it’s unlikely your dog will eat a whole block of chocolate, you should avoid any feeding at all. Citrus fruits like lemon, lime, grapefruit and oranges contain essential oils and psoralens, which can be toxic to dogs. Small amounts of orange is OK, but definitely no rind. Coffee, tea and cola contain caffeine, which can cause poisoning in dogs. The lethal dose of caffeine for dogs is 150mg/kg bodyweight. So while a small lick of coffee, tea or soft drink off the floor is probably fine, a moderate amount of coffee grounds or tea bags can be fatal in small dogs. Garlic is a controversial one. On one hand it has amazing anti-bacterial, anti-viral and anti-fungal properties. Many dog foods (including the early versions of ours) contain garlic, but there are lots of vets that strongly recommend against it. This is because garlic is in the same family as onions (Allium), and can be toxic in large doses. Here's where it gets blurry though. The research this is based on showed 5g garlic/kg to induce hemolytic anemia in dogs. Thats 100g of GARLIC for a Nelly size dog, no wonder it was dangerous! More research is clearly needed to see whether garlic is safe to feed in therapeutic doses. In the meantime it's not a decision we can make for other dog owners which is why you won't find it in our food. Innocent grapes seem unlikely to harm dogs, but it has been linked with renal (kidney) failure in some dogs. The toxic component of grapes and their dried sibling raisins are currently unknown. However, 30g/kg bodyweight was shown to be toxic to the American Animal Poison Control Center, and as few as 4-5 grapes were implicated in the death of an 8kg dog. There is some speculation as to whether grapes are actually toxic to dogs due to a lack of scientific studies, but after our experience with Nelly there's no way we'd ever feed them again! You wouldn’t eat mouldy food, and neither should your dog. Mouldy foods can cause poisoning in dogs called Mycotoxicosis. Symptoms include muscle tremors, seizure, hyperactivity, vomiting, uncoordinated movements, dehydration and a loss of appetite. 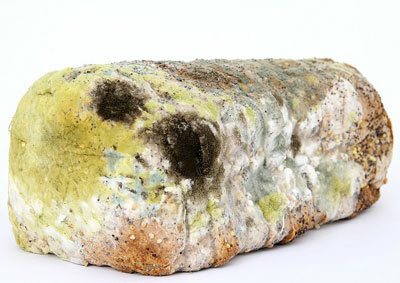 Never feed mouldy foods, and when in doubt throw it out. There are lots of types of mushrooms, some of which can be harmful if your dog eats them. Especially be wary of any that you find while taking your dog for a walk, it could easily be poisonous. Mushrooms can cause GI irritation, muscarinic effects (excessive drooling and tear production), depression, lethargy, and death. An Australian favourite but not so good for dogs. Macadamia nuts have been associated with non-fatal side effects in dogs like vomiting, ataxia, weakness, hyperthermia and depression. The toxin in macadamia nuts and it’s mechanism in the dogs body are not known at this time, and the individual dogs sensitivity to it appears to vary from dog to dog. This means that there is not a definitive toxic level for dogs, but a dose over 2.2g/kg bodyweight has been shown to exhibit these symptoms. 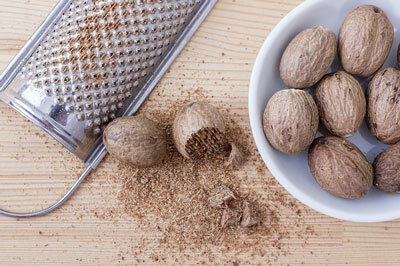 Containing a toxin called Myristicin, nutmeg can cause hallucinations, disorientation, increased heart rate, abdominal pain and possibly seizures if ingested in larger quantities. It's a low level risk, but it’s worth keeping any foods with nutmeg away from your dog just to be sure. Poisonous to dogs in large quantities, salt is ready availability in every kitchen so it’s worth exercising some caution. The lethal dose in dogs is 4g/kg. This is quite a bit of salt, but even still make sure you keep it out of reach. Widely used in the cooking of most foods people eat, onions are one thing you definitely want to keep away from your dog. Part of the Allium species, which also includes leeks, chives, shallots, scallions and garlic, which all can can be toxic to dogs. A toxic quantity of onion will result in Heinz Body Anemia (Hemolytic anemia), which damages the red blood cells and can be fatal. 15-30g/kg can resulted in clinically important hematalogic change. Onion toxicosis is consistently noted in animals that ingest more than 0.5% of their body weight in onions at one time. Thats only 50g for a 10kg dog which is very easy to do it your not careful. And remember to never feed foods that have onion in them, like bolognese and rissoles. Xylitol is used to sweeten sugar-free products like chewing gum, toothpaste and some baked goods. It’s ingestion can result in the development of hypoglycaemia, and hepatic injury/failiure. Dosages over 75mg/kg bodyweight have been associated with hypoglycaemia in dogs. Xylitol is more dangerous than chocolate as far less has to be consumed for toxicity. It can cause vomiting, weakness, ataxia (uncordination), depression, seizures and coma. Please share with your doggy friends!